﻿ Tikal Knowledge - IZWebFileManager New Feature: File Search. IZWebFileManager New Feature: File Search. IZWebFileManager New Feature: File Search. This release brings a new feature: file search. You can search files as easy as you do it in windows explorer. Search result is listed with additional column “Folder Path”, which is clickable and allows to navigate to file containing folder. 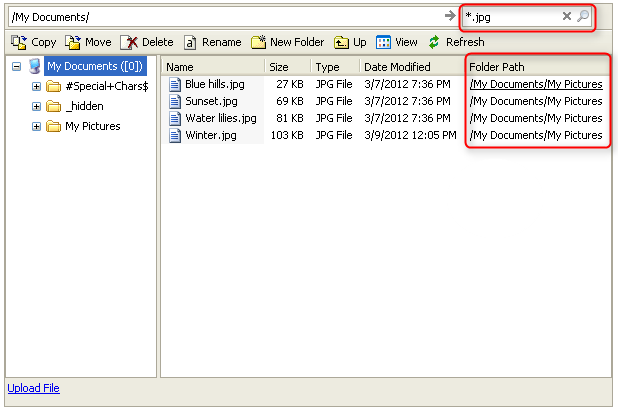 In case you don’t wont allow users to search file, you can hide search box by setting property ShowSearchBox=false.